09:00 am - Welcome Spring to North Beach Park! Join us for our monthly work party and welcome spring to the park with invasive removal. See what’s budding, what’s blooming, and listen for the birdsong. Well, we might be too noisy to hear much birdsong. Here are some pictures. 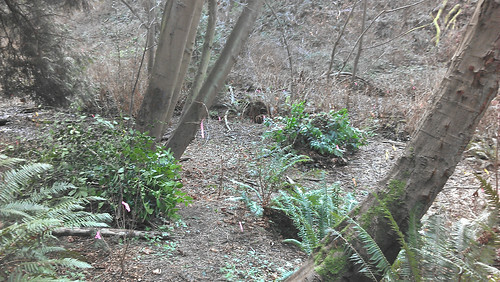 If you haven’t been to the park for a while, you’ll see many pink with black polka dog flags, indicating new plants of many types. And you’ll see how last year’s plants are doing. You’ll also see how much more open the park is, with the holly and laurel removal done by the Natural Area Crew in February. Large piles of laurel and holly. There’s still plenty of work to do. We’ll be concentrating on working between the main trail and the stream, pulling ivy and working downstream. Another crew will go into the Central Valley to put survival rings on trees (this work can be physically demanding). We have a good long stretch of time of invasive removal before next planting season, so let’s keep up the good work! The March work party of 2012 was the first major planting party since restoration started. In the year since, we planted more than 600 trees, shrubs, and ground covers, including many that were being reintroduced to the park. Help us make plenty of room for the 2013 planting season! Meet at the main entrance to the park, 90th St. and 24th Ave. NW. Wear weather-appropriate layers that can get dirty and MUD BOOTS. Parking available on 90th st. east of 24th. We’ll provide tools, gloves, and guidance. Bring water and snacks as you need them. All ages welcome, children must be kept under supervision of guardian or responsible adult. This work qualifies for community service credit. If you need more information, contact Luke McGuff at lukemcguff@yahoo.com. If you can’t make it to the workparty, consider donating to support North Beach Park at the Seattle Parks Foundation. Your tax-deductible contribution will go towards hiring Natural Area Crew to work in volunteer-inaccessible areas of the park.